This is a long overdue review of a novel that I loved. C.W. 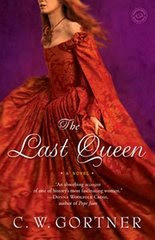 Gortner's debut novel The Last Queen will be released in trade paperback on May 5th. Good historical fiction not only entertains readers by transporting them to another time and place, but also informs. Often you can learn more through fiction than you can through dusty tomes written by historians. Such is the case in Gortner’s brilliant novel The Last Queen. I was ignorant of the lifestory of Juana of Castile until I read this book, and I wonder why her story isn’t more popular. It is filled with passion, intrigue and betrayal by those who should have supported and defended her. Juana was the daughter of Queen Isabella and King Ferdinand, who I knew growing up as the patrons of Christopher Columbus. She was the sister of Catherine of Aragon, the queen of England and first wife to King Henry VIII. She was married to Philip, the Archduke of the Hapsburg Empire and mother to Charles V, the Holy Roman Emperor. And because of deaths in her family, she inherited the title of Queen of Castile. For those in book clubs who would like to schedule a chat with Christopher, you can contact him via his website. He also has a wonderful blog that I follow. I'm glad you enjoyed the review. I loved that book. I wish Christopher well with the launch of the trade paperback and hope it eventually becomes a backlist classic.